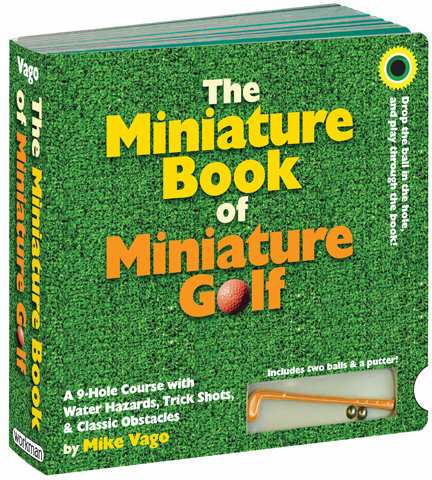 The Miniature Book of Miniature Golf by Mike Vago is a working 9-hole miniature golf course in book form. 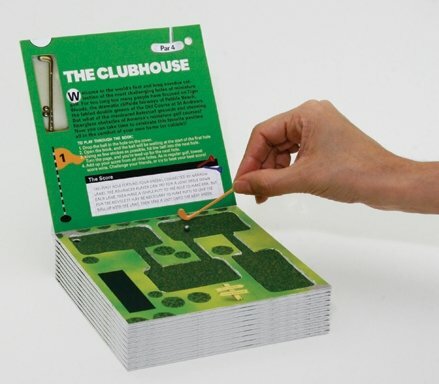 Get ready to tee off on this wee putt-putt course with the little golf club and tiny golf balls that are included with the book. Vago has also authored The Pocket Book of Pocket Billiards. The perfect golfing gift: A book that is a complete, working 9-hole miniature golf course, with miniature golf balls and putter included. The first book you can play through. The book that’s a true original. Featuring nine themed courses, from pirates to dinosaurs to the classic windmill, The Miniature Book of Miniature Golf celebrates the silliness and the golf-for-everyone! attitude of Putt-Putt. 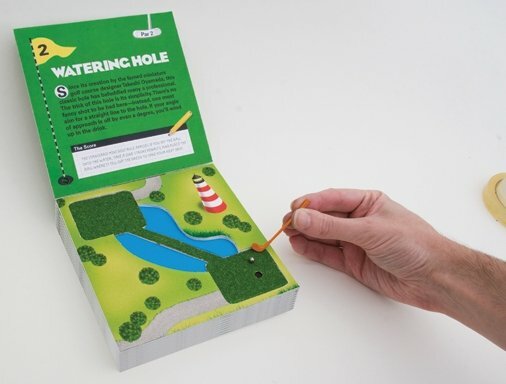 Each page in the book is a cleverly designed hole, modeled on real mini golf courses. Tap the ball through the grooves and make sure to avoid the obstacles. Then see if you can get it in the clown’s mouth on the last hole. Every hole is par fun.